Acupuncture is an ancient healing art for humans and animals that originated in China over 4,000 years ago. Acupuncture involves activating specific body points to stimulate the flow of QI (energy force) and movement of vital substances (fluid, blood) throughout the body. When the flow of QI and vital substances are obstructed, pain, inflammation and disease occurs. The goal of acupuncture is to unblock any obstructions, restore vital substance flow and re-balance the patient. Modern acupuncture is a blend between Traditional Chinese Medicine and Western Scientific research making it a key tool in Integrative Medicine. Acupuncture is performed with sterilized thin stainless steel needles. It is not painful and your pet may only feel the needle as it goes through the skin for a second, if at all. Many animals relax and may even fall asleep with their needles in place. Acupuncture is one of the safest therapies available when practiced by a competent veterinary acupuncturist. Side effects are rare. What are the advantages and disadvantages of acupuncture? Acupuncture is a natural alternative therapy that enlists the body's healing mechanisms to maintain homeostasis and manage disease processes. Unlike with medications, side effects are rare. Acupuncture can be used to treat ongoing symptoms while also working at the root of disease. The main disadvantage of acupuncture is a misunderstanding of what to expect from its use: the belief that the pet will miraculously improve, that all conditions can be treated with acupuncture, and that the animal will only need one treatment. Though some pets have amazing responses to acupuncture, generally a course of treatment is needed. How often and for how long will treatments take? The response to acupuncture is individual and the effects are often cumulative. Usually, a course of acupuncture over a period of weeks is recommended. Your doctor will customize the treatment schedule based on your pet's needs. Chronic diseases usually need chronic long-term treatments. Acute diseases can generally be resolved with a few treatments. Individual needles may stay in place for as little as a few seconds to as long as 30 minutes depending on the condition being treated. 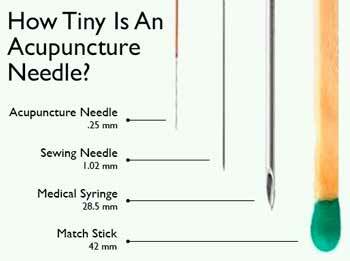 On average, needles are retained in place for about 15-20 minutes. There are many ways of stimulating an acupuncture point including with heat, electrical stimulation, and injection of solutions. Typically animals are treated once a week for 4-5 weeks initially. However, the frequency may be increased in certain acute conditions or spread out to longer intervals in chronic cases. What happens during an acupuncture examination? During an evaluation of a pet for acupuncture treatment, a normal, Western–style examination of your pet is done. Assessment of gum color, capillary refill time, evaluation of the heart and lungs with a stethoscope, palpation of the abdomen, and palpation of the muscles, bones and joints, as well as evaluation of the eyes, ears, nose, and mouth are all performed. In addition to the physical examination, the veterinarian will also review any past medical history, lab work, or radiographs (X-rays) in order to determine the best course of acupuncture treatment. What does the doctor need to know about my pet?